Why Go: The Bora Bora Liquid Festival is a fun and joyous celebration of water sports and Tahitian culture hosted each year during the month of December. With its gorgeous, world-renowned lagoon, Bora Bora sets an unforgettable stage for this ultimate South Pacific experience, which takes place from December 2 – 8, 2013 and marks its 13th anniversary this year. wandermelon’s Eric Hiss discovered the festival while traveling in the region several years ago and was so impressed, he vowed to create an opportunity for others to experience this incredible event. Started as an endurance paddling competition featuring traditional sailing canoes and outriggers, the Bora Bora Liquid Festival has grown over the past decade into a much broader event – think beachfront IronMan meets ultimate beach party. In addition to the adrenalin-pumping competitive events featuring top aquatic athletes battling it out in this world-famous paradise, there are DJ’s spinning at beach parties, festive barbecues, traditional Tahitian dancing expositions, and tours and activities open to everyone ranging from hiking the green spires of the main island to shark and ray feeding adventures. Imbuing every activity, however, is the original spirit of the competition, which is a deep connection to Polynesian culture and community. 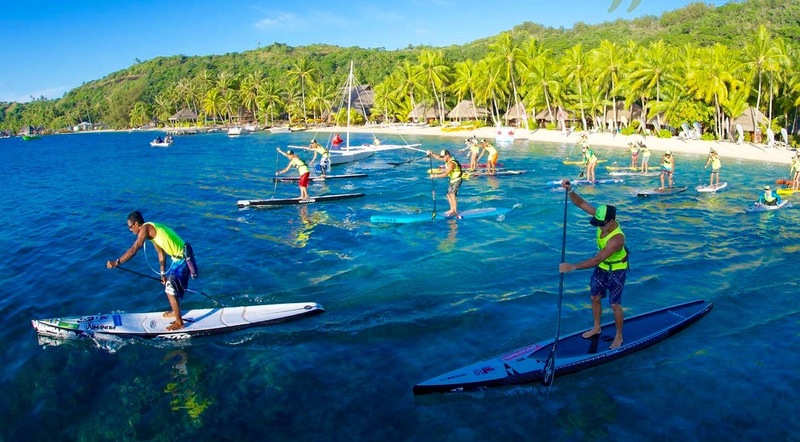 The Bora Bora Liquid Festival now also now includes the world’s fastest growing watersport, Stand up Paddle or SUP, that is featured in shorter sprint races so anyone has the chance against local Tahitians. For more information, schedule of events and to purchase a complete package to this year’s event, check out the Bora Bora Liquid Festival official homepage.